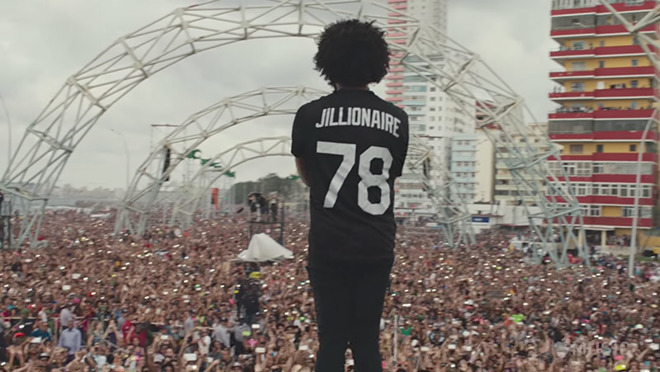 Apple Music snags Major Lazer concert documentary "Give Me Future"
In March 2016, Barack Obama became the first U.S. President to visit Cuba in 88 years, marking an easing of political tension between the world power and the small island republic. That same month, electronic music group Major Lazer self funded the first major Cuban-American concert in Havana, an event that drew nearly half a million attendees. Major Lazer's historic experience, from planning to performance, was captured on film in the documentary "Give Me Future." The film, which debuted to praise at the Sundance Film Festival, will be available to stream on Apple Music on Nov. 17. Apple Music teased the concert documentary release with a trailer this week. The film offers not only a behind-the-scenes look at the challenges Major Lazer had to overcome in arranging the event, but also insightful perspective into Cuba's current political climate. Major Lazer's Diplo, Jillionaire and Walshy Fire act as the common hub of "Give Me Future," with interviews of contemporary Cuban artists and lovers of music interspersed throughout. The latter offer glimpses into the island's tumultuous past, but more importantly illustrate the ways in which music continues to be a driving force toward a hopeful future. The film's title comes from an interview with a fan who provides poignant commentary on the Cuban state. "I live in a city suspended in time — slow paced," she says. "That's why I love electronic music. I don't feel so frozen in time. It gives me a future." Major Lazer on Thursday announced "Major Lazer Presents: Give Me Future — Music From and Inspired by the Film," an album featuring unreleased tracks from Diplo, Cuban artists and others set to debut in tandem with the film on Nov. 17. "Give Me Future" is the latest in a string of Apple Music exclusives that bolster original content like "Carpool Karaoke" and "Planet of the Apps." Earlier this month the streaming service released "Clive Davis: The Soundtrack of Our Lives," and will next week debut "Bang! The Bert Berns Story" to subscribers.